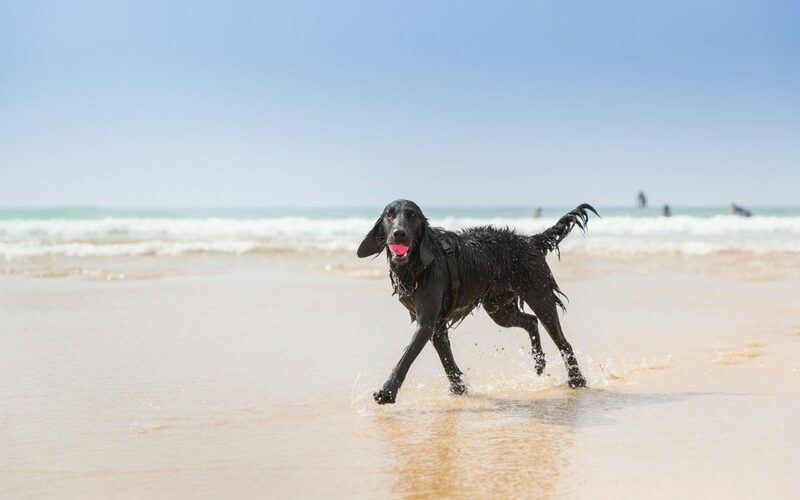 With over 200 dog-friendly beaches to choose from, Cornwall really is a wonderful playground for your coastal companion. 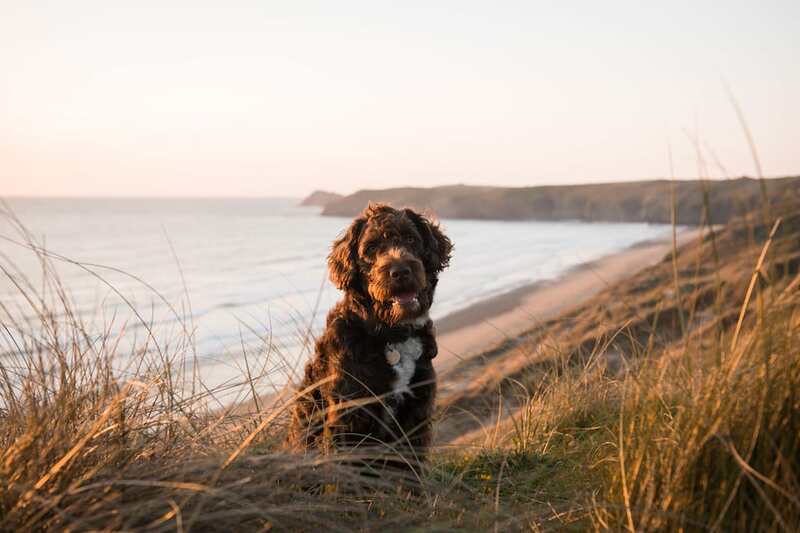 From sheltered coves to miles of windswept sand, we’ve rallied our team and their dogs and headed out to bring you our top 10 favourite beaches. 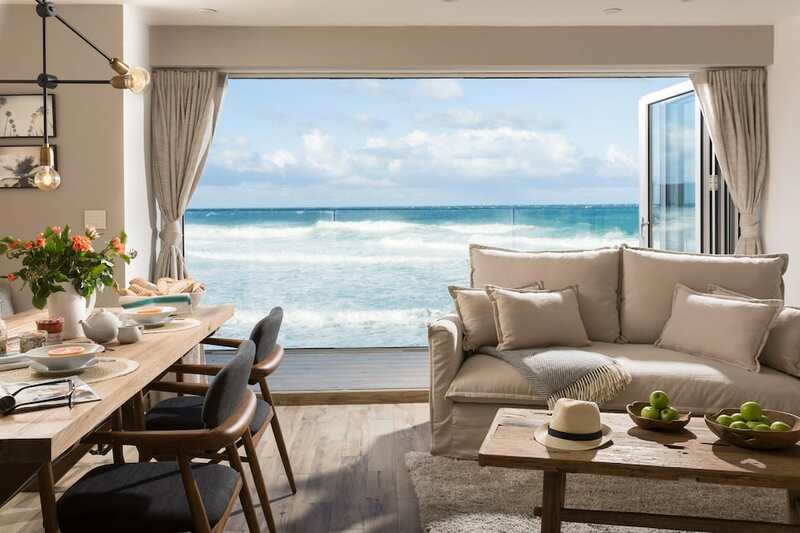 This secluded cove has risen to fame since the opening of the renowned The Hidden Hut cafe that attracts visitors and locals alike to its alfresco beach vibe and feast nights. A stunning spot, sheltered by the headlands, to swim in crystal clear waters, soak up the Cornish sunshine and to stop a while before continuing along the coastal path towards the quaint village of Portscatho or the breathtaking scenery at Nare Head. These wonderful neighbouring beaches are connected with a great coastal path walk of just over 3 miles which leads you up and over some of the counties most iconic scenery as you pass copper mine engine houses, including Wheal Coates, and climb the rusty red cliff paths. 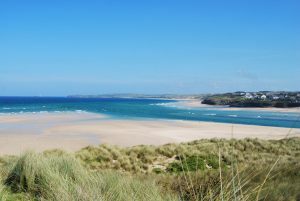 Porthtowan and Chapel Porth offer wide expanses of sand for your dog to bound along the shoreline and dive into the sea. The dog-friendly food and drink stop, The Blue Bar at Porthtowan offers a cool surf atmosphere serving up local cuisine, barista coffees and impressive sundowner cocktails and the Chapel Porth Cafe serves up famous Hedgehog Ice Creams. Nestled under Stepper Point, Hawkers Cove is easily accessed from Padstow harbour. Gently shelving sands stretch over 1.5 miles as the tide slacks. 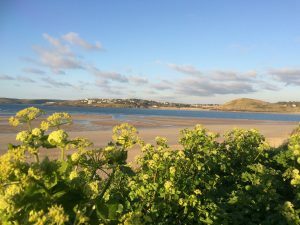 Capture the ebb and flow of the Camel Estuary as it reveals the Doom Bar and winds its way up towards Wadebridge, Rock and Little Petherick Creek. Padstow loves to welcome dogs and you’ll find many cafes and pubs stocked with home-made dog treats. Extend your stomp through the town and onto the Camel Trail, an old tram trail, that hugs the estuary and offers quiet spots for a doggy-dip. treasure washed up from the wreck of a 17th century Spanish ship. Leave the bustling beaches of St Ives and escape to the great stretch of beach at Porthkidney Sands where just a handful of beachgoers and dog-walkers gather. Accessed from the coast path or through the dunes from Lelant, this pristine beach has been dubbed ‘happy dog beach’ by locals. cyclists that pause here on their way between Penzance and Marazion. This picture perfect cove is sheltered from the rolling waves that crash against the high rocks in this dramatic corner of the coast. Park in Port Isaac and head down to the cove of Port Gaverne, a sandy and stoney beach, where azure blue waters make it popular kayaking spot. The Port Gaverne pub is well worth a visit before heading up and over the headland towards Trebarwith Strand. 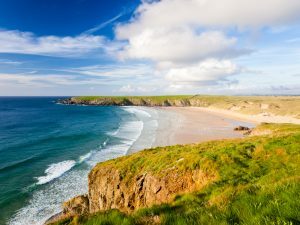 Kelsey Head to spot seals and seabirds and may even catch a glimpse of Captain Poldark as the BBC film the next series against this stunning backdrop. The Hungry Horsebox is on hand in the warmer months to help refresh and refuel you with lunch-on-the-go. To the east of Sennen Cove, the rugged, more secluded Gwenver is wild, remote and beautiful. Accessed via a steep cliff path or a short walk from Sennen, the crowds are kept at bay. But if you’re serious about stepping foot on the coarse white sands, scrambling over wave-hewn boulders and dipping in unforgiving waves, this is paradise. sand that’s popular with surfers and swimmers. Food for Thought provides tea, coffee and take away food to keep the hunger at bay or enjoy the laid back coastal pub of Harlyn Inn. 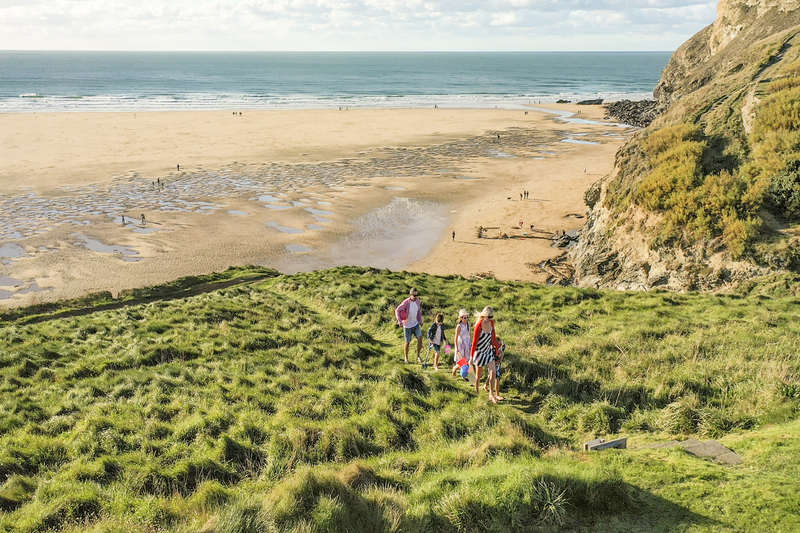 Continue your exploring along the coastpath to Rocky Beach at Trevone and onwards past the blowhole to Padstow. It’s never been easier to plan a dog-friendly holiday in Cornwall. 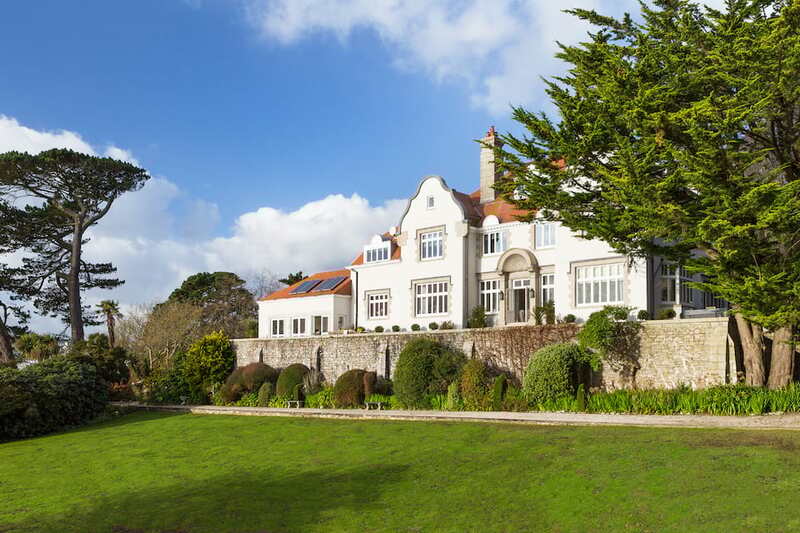 Gone are the days of limited choice and sub-standard accommodation, over 90 of Cornish Gems luxury properties welcome four-paws, we even leave hand-baked dog treats from Buddylove Dog Treats to get those tails wagging. View our collection here or give our Travel Advisors a call on 01872 241241 to plan your next holiday, with your dog in tow.